Survivor Series (2017) was a professional wrestling pay-per-view (PPV) event and WWE Network event, produced by WWE for the Raw and SmackDown brands. It took place on November 19, 2017, at the Toyota Center in Houston, Texas. It was the thirty-first event under the Survivor Series chronology. The theme of the event was brand supremacy, and every match of the main card featured wrestlers of the Raw brand facing wrestlers of the SmackDown brand. Ten matches were contested at the event, including three on the pre-show. The card was highlighted by two traditional Survivor Series elimination matches. In the main event, Team Raw's men's team defeated Team SmackDown's, and in the other elimination match, Team Raw's women's team also defeated Team SmackDown's. Also, every champion of the Raw brand faced their counterpart champion of the SmackDown brand in non-title matches, with the exception of the WWE Cruiserweight Championship, which was the only title to be defended where Enzo Amore retained against Kalisto on the pre-show. Other prominent matches of the main card included Universal Champion Brock Lesnar defeating WWE Champion AJ Styles, which was the only one of four champion versus champion matches in which Raw defeated SmackDown, and The Shield defeated The New Day in their first pay-per-view match together since Payback in 2014. Raw won brand supremacy by winning four of the seven matches on the main card. The card featured ten matches, including three on the pre-show, that resulted from scripted storylines that had results predetermined by WWE on both the Raw and SmackDown brands. Storylines were produced on WWE's weekly television shows, Monday Night Raw, SmackDown Live, and 205 Live, the latter of which is cruiserweight-exclusive. At Raw's pay-per-view No Mercy, Brock Lesnar defeated Braun Strowman to retain the Universal Championship, while at SmackDown's Hell in a Cell pay-per-view, Jinder Mahal retained the WWE Championship against Shinsuke Nakamura. On the October 17 episode of SmackDown, after returning from a trip to India, Mahal said that a young boy had questioned what was next for him. Mahal said that he had defeated every worthy opponent on the SmackDown roster and that at Survivor Series, he wanted to face Raw's top champion, Brock Lesnar. Mahal, however, was interrupted by AJ Styles, who took exception to Mahal's claim and challenged Mahal for the WWE Championship. Mahal said that Styles was a joke, and Styles retaliated by attacking Mahal and The Singh Brothers (Samir and Sunil Singh). Backstage, Mahal confronted SmackDown General Manager Daniel Bryan about the incident, and said that one of The Singh Brothers should make Styles pay and Bryan agreed; Styles defeated both Sunil and Samir, respectively, on the following two episodes. Lesnar and his advocate Paul Heyman appeared on the October 23 episode of Raw to address Mahal's challenge where both laughed at it. Heyman stated that Mahal was not Lesnar's counterpart, nor worthy of being WWE Champion, however, they accepted the challenge. 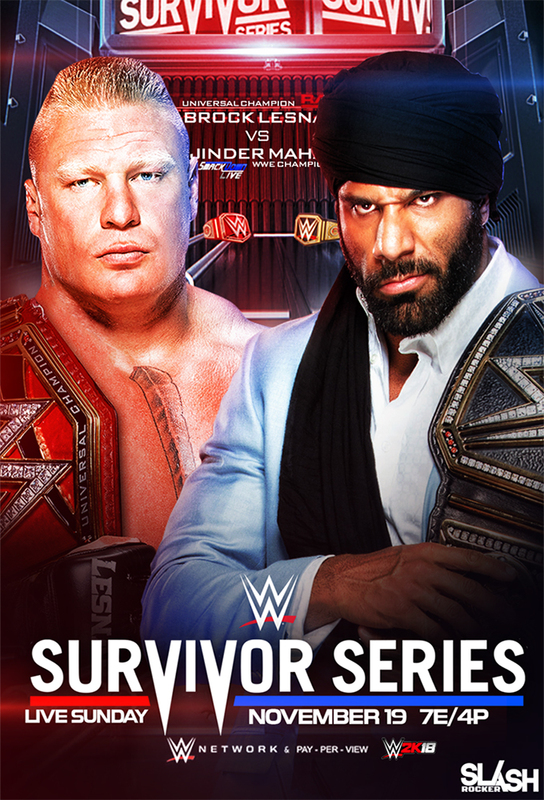 The next couple of weeks on SmackDown, Mahal responded to Lesnar, stating that he had overcome much adversity and he would defeat Lesnar at Survivor Series. However, it was then announced that Styles would face Mahal for the WWE Championship on the November 7 episode of SmackDown, where Styles defeated Mahal, making him the WWE Champion facing Lesnar at Survivor Series. Lesnar and Heyman appeared on Raw the following week to address Lesnar's new opponent, stating that Styles was the ultimate underdog, but that Lesnar was the number one champion in WWE history. The following night on SmackDown, Styles and Bryan mocked Lesnar and Heyman, with Bryan acting as Styles' advocate, and Bryan said that Lesnar always mentally quits when he enters deep waters and Styles would "drown" Lesnar at Survivor Series. On the October 23 episode of Raw, Raw General Manager Kurt Angle announced the match card for Survivor Series. With the exception of Raw's WWE Cruiserweight Championship (as it did not have a SmackDown counterpart), every champion of the Raw brand was scheduled to face their counterpart of the SmackDown brand in non-title matches: the Universal Champion against the WWE Champion, the Intercontinental Champion against the United States Champion, the Raw Women's Champion against the SmackDown Women's Champion, and the Raw Tag Team Champions against the SmackDown Tag Team Champions. Angle also announced that there would be two traditional Survivor Series elimination matches, one male match and one female match, pitting five of Raw's male and female wrestlers against five of SmackDown's male and female wrestlers, respectively. Intercontinental Champion The Miz kept his spot in the Survivor Series match by retaining his title against Matt Hardy on the October 30 episode of Raw. Baron Corbin also kept his spot by retaining the United States Championship against Sin Cara on the November 14 episode of SmackDown. Also on the October 30 episode of Raw, Alexa Bliss retained the Raw Women's Championship against Mickie James, keeping her in the Survivor Series match against the SmackDown Women's Champion; her opponent was originally Natalya, but was changed to Charlotte Flair, who defeated Natalya for the title on the November 14 episode of SmackDown. On the November 6 episode of Raw, Cesaro and Sheamus defeated Dean Ambrose and Seth Rollins to become the Raw Tag Team Champions, thus making them the champions for the Survivor Series match against The Usos (Jey and Jimmy Uso) who, despite losing by count-out, retained their SmackDown Tag Team Championship against Chad Gable and Shelton Benjamin on the November 7 episode of SmackDown. As Raw General Manager Kurt Angle was about to announce the members for Team Raw's men's team on the October 23 episode of Raw, SmackDown Commissioner Shane McMahon with several male and female SmackDown wrestlers came through the crowd. They proceeded to the backstage area and laid out all of the men and women of the Raw locker room. The following night on SmackDown, SmackDown General Manager Daniel Bryan was surprised that Angle and members of the Raw brand did not invade SmackDown, but warned Shane that they would eventually show up for retribution. That same episode, Team SmackDown's men's team got its first member when Randy Orton qualified by defeating Sami Zayn. The following week, Shane announced himself as the captain of Team SmackDown and explained their invasion of Raw, stating that SmackDown had always been looked at as the inferior brand. He also said that Raw would pay for injuring Bryan, who Kane had attacked with a chokeslam the previous night on Raw. Later that episode of SmackDown, Bobby Roode and Shinsuke Nakamura qualified for the team by defeating Dolph Ziggler and Kevin Owens, respectively. The last spot for Team SmackDown was originally going to be determined the following week in a match between AJ Styles and Rusev, but that match was canceled after Styles was scheduled to face Jinder Mahal for the WWE Championship that episode. Rusev instead faced Orton to qualify, but failed to defeat him. The following day on Twitter, Shane announced free agent John Cena as the final member of Team SmackDown. Raw Commissioner Stephanie McMahon made her return on the October 30 episode of Raw and confronted Angle; her last appearance as Raw's Commissioner was at WrestleMania 33. She said that SmackDown's invasion was an embarrassment to Angle and the entire Raw locker room. She then gave Angle the opportunity to redeem himself by naming Angle the captain of Team Raw's men's team. However, she said that if Team Raw were to lose at Survivor Series, Angle would be fired as the Raw General Manager. Afterwards on Twitter, Angle named Braun Strowman as his first pick for Team Raw. The following week, after their match ended in a double count-out, Samoa Joe and Finn Bálor were both added to Team Raw by Angle. Bálor then dived off the stage onto Joe. Later that episode, Angle named Jason Jordan as the final member of Team Raw. The very next week, however, Stephanie disagreed with Angle's final pick and said that she wanted to decimate SmackDown. Later in the show, Jordan was (storyline) injured by a returning Bray Wyatt, and rendered unable to compete by Angle. Jordan begged Angle to not remove him from the Survivor Series match. Angle could not bring himself to do it, after which, Chief Operating Officer Triple H returned (his first appearance on Raw since WrestleMania 33) and announced himself as Jordan's replacement, and then attacked Jordan with a Pedigree. The following night on SmackDown, during a tag team match between The New Day and Owens and Zayn, Raw invaded SmackDown by attacking the roster. After everyone was taken out, Shane McMahon was attacked, suffering an Angle Slam by Angle and two Triple Powerbombs by The Shield. Team Raw's women's team began to take shape also on the October 23 episode of Raw. A triple threat match between Alicia Fox, Bayley, and Sasha Banks was scheduled to determine the captain for Team Raw, which was won by Fox. The following week, Fox was originally scheduled to face Bayley, but as Team Raw's captain, she instead had Nia Jax face Bayley, which Jax won. After the match, Fox chose Jax as her first pick for Team Raw. Fox then added Asuka to the team after the latter defeated Stacy Coates. Later, she added Banks to the team after Banks and Bayley defeated Fox and Jax in a tag team match. Bayley won the final spot on Team Raw by defeating Dana Brooke and Mickie James in a triple threat match on the November 13 episode of Raw. On the October 24 episode of SmackDown, Becky Lynch, Ms. Money in the Bank Carmella, Charlotte Flair, Naomi, and Tamina were announced as the five members of Team SmackDown's women's team; Lynch was named captain by defeating the other four in a fatal five-way match. The following week, Lynch said that Team SmackDown needed to be ready if Raw were to invade them. Then-SmackDown Women's Champion Natalya interrupted and said it was unfortunate that she was not the captain, but would defeat Raw Women's Champion Alexa Bliss. She also said that Lynch needed to find who the weak link was on their team. Flair was then removed from the team after winning the SmackDown Women's Championship, and replaced by the wrestler she defeated for the title, Natalya. On the November 6 episode of Raw, during Dean Ambrose and Seth Rollins' Raw Tag Team Championship defense against Cesaro and Sheamus, SmackDown's The New Day (Big E, Kofi Kingston, and Xavier Woods) appeared in the crowd to make Raw believe that SmackDown were invading them again. General Manager Kurt Angle signaled for the Raw locker to go after The New Day. During the distraction, Sheamus pinned Rollins to win the Raw Tag Team Championship for him and Cesaro. Roman Reigns, who had been out with an illness, returned the following week and The Shield challenged The New Day to a six-man tag team match at Survivor Series, which was made official. The following night on SmackDown, The Shield invaded SmackDown during New Day's tag team match against Kevin Owens and Sami Zayn. Owens and Zayn bailed while The Shield attacked The New Day. At Raw's pay-per-view TLC: Tables, Ladders & Chairs, Enzo Amore defeated Kalisto to recapture the WWE Cruiserweight Championship. Kalisto invoked his championship rematch on the following episode of 205 Live, but Amore retained after he was disqualified for attacking the referee. Kalisto then attacked Amore out of anger. The following week on Raw, Kalisto defeated Drew Gulak, who had Amore in his corner. After the match, Amore attacked Kalisto with the JawdonZo. Another rematch between the two for the Cruiserweight Championship was scheduled for the Survivor Series pre-show. On November 19, just prior to the event, WWE announced two non-interpromotional matches for the Survivor Series pre-show: Raw's Elias and Matt Hardy were scheduled to face each other, and SmackDown's tag teams Kevin Owens and Sami Zayn and Breezango (Fandango and Tyler Breeze) were scheduled for a match.